fixed period of time before it sets. 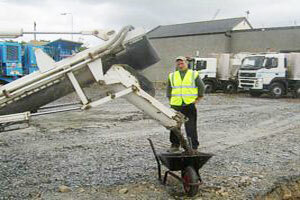 The mix cannot be changed and, if the customer has over-ordered, concrete goes to waste. If they have under-ordered, the mixer must return to the batching plant for a part load. 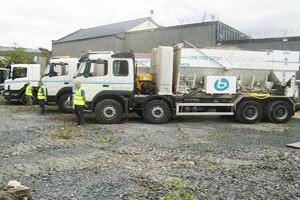 - - - On The Spot Concrete with their fleet of Cementech Volumetric Mixers! Because dry ingredients are mixed on the spot, the concrete always arrives fresh – no older than seven seconds – on site. The Cementech machine’s uniquely precise dispensing system means these mixers are accurate to within ±1% of volume delivered and if the customer has over – ordered, the mixer can be shut off without any wasted concrete. The mix can be changed during the run to suit customer specifications precisely so, if two different mixes are required, there is no need to return to the batching plant. In other words, there are no part loads, no waste, no time limits, just precise, profitable productivity – a premium service that customers appreciate. 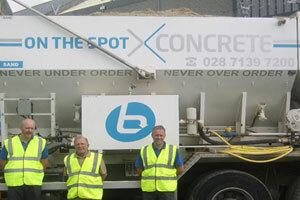 This relatively new service offered by A.S. Ballantine Ltd. with their new concrete division “On The Spot Concrete”. Having been in the Quarry and Blacktop Business since 1953 the company had been considering moving into concrete for some time. However with several traditional concrete companies around, A.S. Ballantine Ltd. wanted to offer something different, a better more flexible service. Hence the decision to invest in the best volumetric mixers on the market. 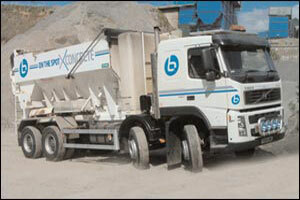 On The Spot Concrete has been launched with a fleet of three mixers. On The Spot believe that demand will grow as the benefits of these machines and the service offered become more widely known. 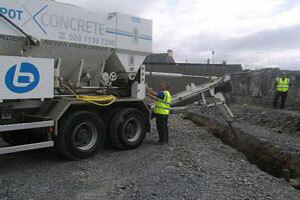 As well as standard mixes these mixers can incorporate specialist admixtures and fibre into the concrete and the delivery of small amounts do not pose a problem. The customer gets exactly what they want and the exact amount they need. Never under or over order again. 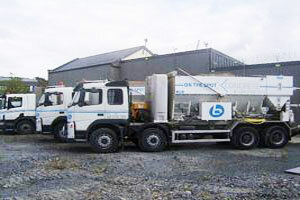 Of particular interest to Utilities contractors is the ease with which these mixers can produce foamed concrete for the back filling of trenches on roads, preventing trenches sinking and hence costly remedial works. Copyright © NI Web Solutions. All rights reserved.